It’s incredible that in the US we are expected to prepare our own tax returns! Even a simple return can prove quite challenging for someone new to preparing one, so it’s natural to turn to other sources for help. Grad students have a double disadvantage in this area: 1) Their income and expenses are a bit unusual, so finding the right help can prove difficult. 2) They don’t have much available cash to pay for help. The good news is that there are numerous 100% free sources of help for your tax return. I think the IRS should be the first place you turn for help when preparing your tax return! After all, they have the final word on how to properly fill out a tax return. The IRS provides multiple sources of 100% free help. The central form of your tax return is Form 1040. (Non-residents will use a Form 1040-NR. In previous years, you might have used a Form 1040-A or Form 1040-EZ, but those no longer exist post-Tax Cuts and Jobs Act.) That is the one every filer will fill out. 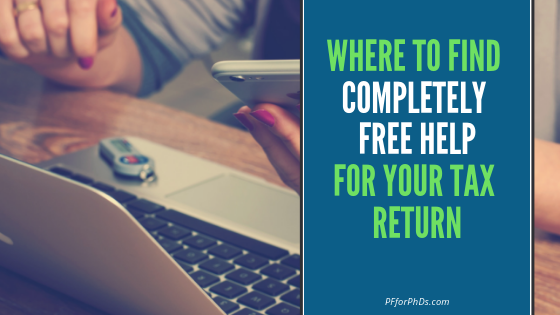 If you have a simple return, that’s where it stops, but if your return is more complex, you may have some additional schedules and forms to fill out. Form 1040 comes with a detailed instruction booklet. If you’re ever confused about what the form means, just refer to that particular line in the instructions. In addition to the PDF publications, the IRS has large set of tools known as the Interactive Tax Assistant. After selecting your question of interest (e.g., Do I Include My Scholarship, Fellowship, or Education Grant as Income on My Tax Return? ), the ITA will prompt you for information and give you an answer at the end of the process. Additionally, the IRS has instead created numerous publications to explain their interpretation of the code even more clearly. These publications are also frequently broken up and summarized into articles that are easily searched on the IRS website. The IRS also provides free tax software for low-income individuals and households through its Free File system. If you have a household income below $66,000 per year, you can take advantage of it. Very well-known software providers like TurboTax® and TaxAct® have Free File versions available. If you would rather wait on hold than sift through publications on your own, you can call the IRS Help Line. Sometimes a customer service agent can quickly answer your question and clear up your confusion. The hotline is available from 7am to 7pm “local time.” The last time I called, local time was determine by my phone number’s area code, not the time zone where the call actually originated. The customer service agents don’t have access to any special information. Everything they reference is already publicly available. If you don’t qualify for the IRS Free File software, you may be able to use free versions of other software, like TurboTax® (affiliate link). Software like this prompts you for relevant information to assemble your tax return, so it’s an easy way to access professional tax advice. However, if your return becomes complex enough, you may be required to pay a fee to complete and submit it. As with anything you find online, you have to take tax information with a grain of salt. Check the source and check their references. You are not receiving advice tailored to your situation, even if you’re listening to an expert. A special word of warning for tax year 2018: Check the publication date on any articles or posts. The Tax Cuts and Jobs Act was a once-in-a-generation tax overhaul, and a lot of things changed between 2017 and 2018. Triple-check any information you find that was originally published for tax year 2017 or earlier. Your university and local civic organizations (e.g., libraries, community centers) may provide free tax help. It might even be tailored for students and/or low-income individuals. A number of universities have hosted my tax seminar, and others ask local CPAs to volunteer their time. One common program at universities and elsewhere is Volunteer Income Tax Assistance (VITA) for taxpayers earning less than $55,000 per year and others with particular needs. If you avail yourself of help from any of these sources, please be aware that the volunteers and even professionals may not be well-trained in the nuances of higher education income and expenses as relevant to PhD trainees. My workshop for funded PhD students provides (in video format) exactly the information grad students need to prepare and understand their tax returns. It includes special scenarios, such as for dependents and students under the age of 24. The best component of the workshop is the live Q&A sessions, in which you can ask any questions you have after viewing the videos. Working through the components of this workshop will massively cut down on the time you need to spend researching how to prepare your tax return as it is narrowly tailored for funded graduate students. Tax software such as TurboTax® (affiliate link) is very popular, and it’s probably the cheapest and fastest way to have your tax return prepared professionally. As entering your higher education income and expenses into TurboTax® can be unintuitive, I created a guide to help grad students with these steps. Again, these are inexpensive ways to prepare your tax return quickly and with confidence, even if you end up paying a small fee to submit your return through the software. Finally, some tax questions are just too nuanced for the answers to be clearly found for free online. Last fall, I hired a tax firm to validate my overall approach to grad student and postdoc taxes and research some really gnarly questions. As I learned, there is a lot of gray area when it comes to taxes! The relevant sources are the tax code, the IRS’s translation of the code (e.g., the publications), the court rulings that help interpret the code, and finally, what the IRS actually elects to enforce. If you’d like to benefit from this research (and the benefits may include a literal reduction in your tax liability! ), you’re welcome to join my tax workshop for grad students.